of the violations under scrutiny here. 11 #12 Conductors in a box designed for 6 (assuming the box is 1-1/2" deep and not 1-1/4") Including the deduction for the clamps, there are 6 too many conductors in the box. The box appears to be unsupported. 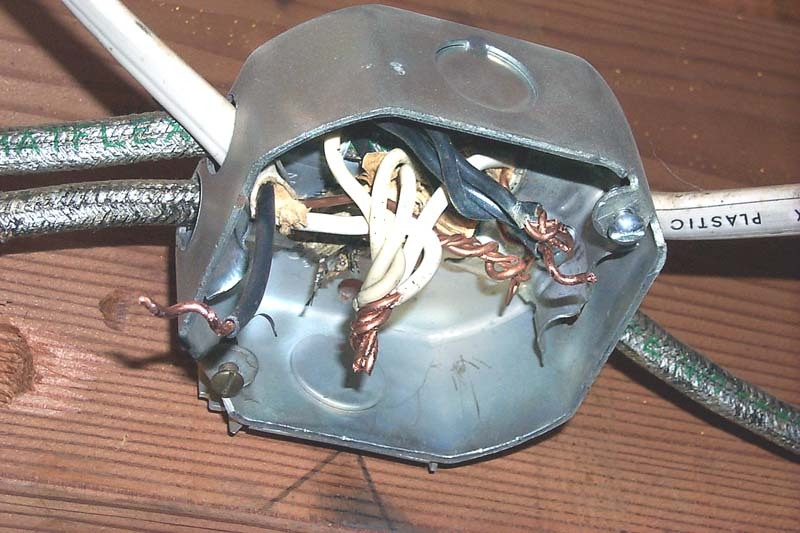 The ground wires should be snipped off IF there is no "true" ground present in the box...OR if one of the 12-2-G wires is the feeder, the box isn't bonded properly. The conductors do not have six inches of free length. Are the cables stapled within 12 inches of the box? Doubtful, but inconclusive in the photo. To Comment on your other Comments, they are pretty good. The location is in a basement so it may have been a porcelain fixture location at one time. I never heard the 1/4" jacket rule only being for plastic boxes unless they mean that it should be longer in other boxes such as this with clamps in which case I would say that the jacket should extend 1/4" further than the clamp. Maybe someone else has a comment on this? Are the clamps upside down? The white jacketed cable on the left in not correctly installed in the clamp, and I don't think you are permitted to place more than one cable under a single clamp. You are probably right about the clamps. Do you know why they are shaped like they are though? Here's another.. Hmm what was the name of that Chubby Checker song? The neutral wires are twisted in the wrong direction... (counter-clockwise). For that matter, I guess the hot wires were too. Are the clamps designed for BX or other Cable? Ding Ding Ding !! You got what I was looking for! I guess the Chubby Checker mention must have done it. When this box was opened the wirenut just about fell off the white wires. This occurrance is often accompanied by having tape wrapped around to hold it on. The clamps came with the box I'm sure. I was wondering myself why they are shaped like they are and if a wire was allowed to be installed as the newer one on the left seems to be. I can see an advantage to putting the cable in this way if say an extension ring was added it would be easier to reach the wires. I don't think that the clamps are designed for Bx because there is no provision to retain the anti-short bushing on the cable. As I remember some of these older boxes had the "romex" knockouts in the top as well as in the side allowing installation on the bottom of a floor joist and entry through the top of the box. I think the clamps were designed to accept cables either through the top or side knockouts - thus the rounded cable formations on top and side of the clamp.